2. Feather steak has a tough centre that starts to collapse when the meat is ready. If you stick a thin skewer through the centre there should be no resistance. (Alternatively, use a meat thermometer: the internal temperature should be around 88°C.) If it’s not ready, cook for another 30 minutes and check again. Remove from the barbecue (or oven), brush off any excess seasoning and leave to rest, loosely covered with foil, for at least 20 minutes. 3. 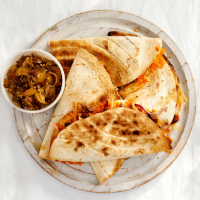 For the quesadillas, set the barbecue up for direct grilling, with the coals directly under what you’re cooking. (You can cook on the grill bars or put a wide cast iron pan on the grill. Alternatively, if your barbecue has an option for a flat top, use that.) Lay a tortilla on a plate and spread with a little chipotle paste in a circle like a pizza base. Mix the two cheeses together and sprinkle some over one half, then chop the steak into small cubes and put some on top. Add more cheese, top with the onion and fold over into a half moon. Repeat with the remaining tortillas. Grill the quesadillas for 2 minutes on both sides, or until toasted and the cheese has begun to melt. (You may need to do this in batches.) Finish with a squeeze of lime juice.